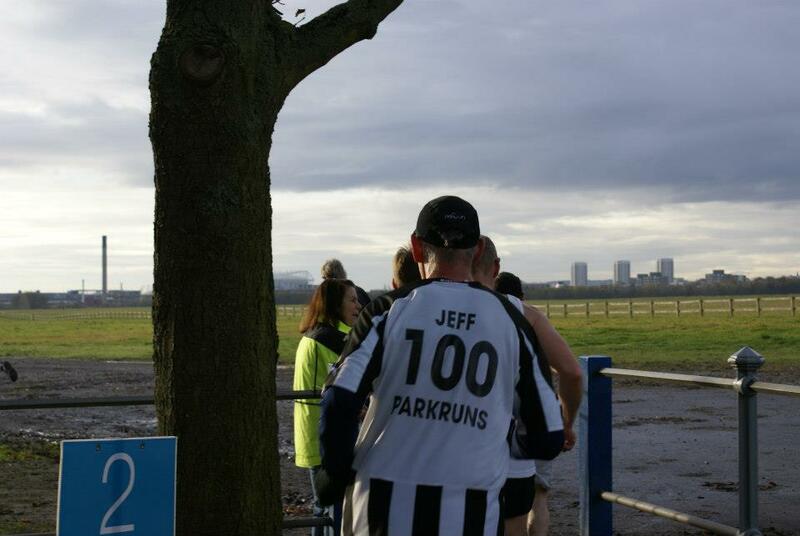 I’d given up running the New Year’s Eve parkrun in favour of this race, so I was very relieved to thoroughly enjoy it. After my worries about road shoes and running on a muddy Town Moor, I was kindly offered a loan of some trail shoes on the day, but decided in the end not to risk aggravating my plantar problems trying out new shoes. So I stuck my old Saucony’s on, taped up the gaping toes and hoped for the best. And so I found myself being warmly greeted by Jane (a Fetchie I haven’t seen for a while) at the deserted cafe where I lined up to pick up my number. A quick pop back to the car to lose a few layers and decide what I was running in, and then back to see hundreds of runners arriving, including Dave, Peter and Mark as well as some other familiar faces from local clubs and races. Trying to keep warm and regretting opting for short sleeves and no gloves, I chatted to Ian, Les and Kelda and finally got to meet George the pug who is gorgeous. I could have just picked him up and snuggled him under my vest, but instead settled for some ear tickles, snuffles and a good lick. It was a bit of a delayed start as runners were still turning up to register and there was a short children’s race beforehand. But soon we stood, looking at the hills that lay ahead, the horn sounded and we were off along the path and over the grass. My goal was just to treat this like a training run. Relax, enjoy and don’t think about time targets. Certainly nothing like a road 10k. And so it proved with people foolishly trying to skip the puddles out on the rough path and then stopping to get through the narrow gate. I remembered my lessons about trail running, shortened my stride and stopped trying to run like I was on tarmac. The damp grass meant I often had to pick my feet up to escape a muddy slide and the off road route forced me to take it steady. I was on steadier ground on the rough path along the side of Grandstand road, part of the parkrun route. My hands were still a bit chilly and I got the sharp, nerve like pain in my right shoulder that I sometimes get on a cold run. Thankfully I know this will pass if I just keep on moving and ignore it. I exchanged a cheery greeting with Jane as she caught and passed me but resolved to try and keep her light blue hat in sight for as long as I could and just settled into the run. A shout out from parkrun regulars Ian and Angela Kirkley was a welcome boost as supporters would have had a cold afternoon on the moor. I was always keeping in mind those hills and taking on board my Ian’s advice to keep it steady, but shortly after that shout out was the toughest bit of the course – a path over a long grassy slope, a hard slog, pulling on my legs and still the hills to come. When they arrived, I said to myself I’d try to run as much of them as I was able. Up ahead people were walking, but I powered on, taking little steps and using my arms. It was hard going and my feet slipped a couple of times, until about 2/3 of the way up to keep my footing I slowed to a walk. 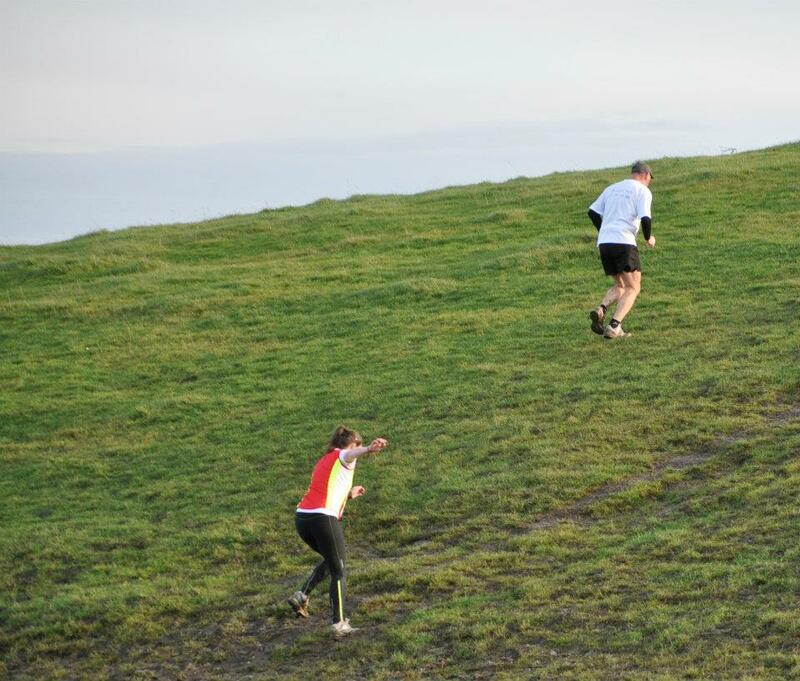 But I’d overtaken a good couple of runners on my way and managed to stay on my feet for the downhill. Next, another hill, not so high, but possibly even more slippery underfoot. I ran this one on the first lap then almost came a cropper on the way down. A nifty bit of speedy footwork and airplane arms saved me. A short spot of tarmac and round for the second lap. Now I knew what to expect I relaxed a bit more and with feet already wet through went sploshing over the ground. Despite the grass being more churned up by the runners ahead, I actually felt on safer footing the second time round as my devil may care attitude settled in. On the rough path I began to feel my foot niggle a little this time and I wasn’t sure whether I should slow down or plough on. I went for the later option, as by now I was nicely warmed through, breathing easily and actually enjoying my longest run for a couple of weeks. Another shout out from the Kirkleys and then a marshall pointed out the figure ahead and said “You can catch her, she’s a reasonable target”. I looked up and saw Jane’s hat, still quite a distance away, but definitely catchable. Slowly, slowly over the grassy slope I ground the distance down, eking out the inches ahead of the two hills. I knew I had a chance on the hills, using my upper body strength to power me up. But alas, my footing and the churned up ground meant I had to slow to a walk around half way up the first one and once I lost my rhythm I went slower and slower, chest almost to my knees with the effort. Down the slope, and conscious of staying steady on my feet. I followed the path taken by another runner, slightly away from the groove taken by many pairs of other feet. And somewhere between the down of one and the up of the next I managed to catch and pass Jane. I hope she caught my breathless encouragement. By now I knew I was close to the finish. Just a wet muddy field to cross and then a welcome bit of tarmac to the end. 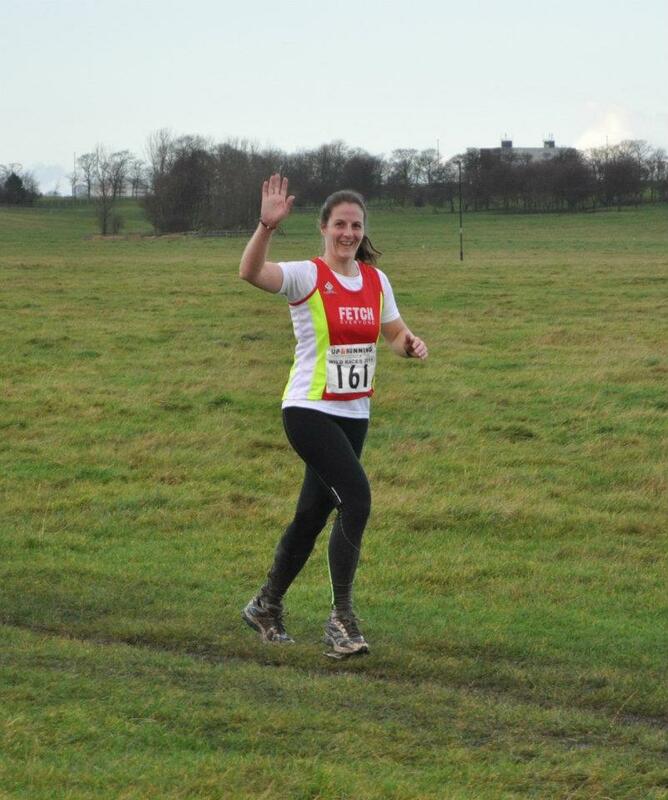 I managed a smile and a wave to a friendly photographer and then began to wind it up a bit, still conscious that the ground here was very wet and slippery. I glanced at my watch and saw just over 5 miles and I knew then that it would be a short course. I had I reckoned less than 5 minutes to run, so I pushed on. As I approached the tarmac of the final straight I saw Peter who gave me an encouraging shout for the finish. And I went straight into a good wind up sprint. It was way earlier than I normally go, but I managed to keep something like 5k pace for the last couple of hundred metres and really blitzed it out over the finish. Ian and Les came over to say well done as I crossed the line, but as I looked to reply, I had a massive head rush and went a bit wibbly legged. Luckily a quick head down and stop restored my senses and I was soon smiling and comparing mud spattered trainers. What a good fun way to start the New Year!